Temptation Island star Heart Evangelista may have some 'personal' issues with her co-Kapuso star Marian Rivera. But, her tweets this morning crossed the boundaries as a professional. "Gudmorning everyone!! 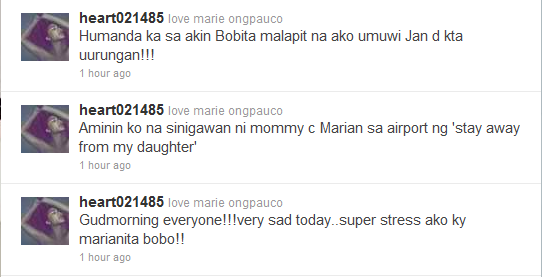 !very sad today..super stress ako ky marianita bobo!!" "Aminin ko na sinigawan ni mommy c Marian sa airport ng 'stay away from my daughter'"
"Humanda ka sa akin Bobita malapit na ako umuwi Jan d kta uurungan!!!" Obviously, the account was hacked. Heart's vocabulary in these tweets are jejemon style.